I know what you’re thinking: Massage is NOTHING like exercise! Exercise makes you sweat, gets your heart rate up, and it’s something a lot of people don’t enjoy doing–at least not nearly as much as getting a massage. And while the obvious differences are true, the two have more in common than you might think. Frequency and Consistency: If you go to the gym once or twice a year, that’s awesome! That’s better than not going at all! However, if you complain about not meeting your fitness goals and you only exercise once or twice a year, it’s kind of a no-brainer as to how you aren’t reaching those goals. Massage is the same way. If you have back pain, headaches, limited range of motion, and the like, and you only see us “when it’s really bad,” don’t expect us to be able to fix you in one go. The more frequent your bodywork is, the more results you are going to see from it. The American Massage Therapy Association said, “Massage has its greatest benefits over time. The therapeutic effects of massage are cumulative, so the more often you get a massage, the better you will feel and the more quickly your body will respond.” So if you came in once because you have back pain and you didn’t get the results you were looking for, you need to come back again! Talk to one of our Licensed Massage Therapists to know how often you should be coming and what your goals are. Lactic Acid: When you workout, your body will releaselactic acid, a naturally occurring substance that your body creates when it has a low oxygen level and breaks down carbohydrates for energy. A knot is built up lactic acid, and a massage will squeeze that build up out of those muscle fibers. This is why you can become sore after a massage, but usually feels more like a workout kind of sore. You get these buildups from overuse or repetitive motions and eventually, those buildups prevent your muscles from contracting the way they should. Drink Water! With knowing what lactic acid is and how it can affect your body during a massage, it would be ludicrous to think that you could do a strenuous workout and not drink water. So why would you do that after a massage?!? While there have been studies showing that increasing your water intake after a massage doesn’t specifically affect your body as much as we used to think it does, it’s always a good idea to drink more water. It takes a LOT of water to overdose (which is actually a thing–check it out). You’ve been laying there for an hour; it’s good to replenish your water and hydrate your cells. Metabolism: Much like exercise, massage can boost your metabolism. Please note: Getting frequent massage, while can and does boost your metabolism, is not a viable option for weight loss. You must do so much more than just massage for weight loss. And much like exercise, you need more than just exercise for weight loss. “There is a cumulative improvement in metabolic function. Massage has no known effect on blood pH, oxygen consumption, pulse rate or blood pressure except indirectly as a result of relaxation.” This means that there is an overall benefit, mainly due to the fact that you are actually taking time for yourself and allowing yourself to relax, which initiates more of the digesting and metabolic functions within the body. With our society being so go-go-go, we need some time for ourselves to allow our metabolism to function as best it can and for our parasympathetic nervous system to kick in and decrease our cortisol levels (stress hormone) and increase and promote a more restful state. Listen to your “trainer”! If you’re paying a lot of money for your training sessions with a personal trainer, but you don’t listen to anything they actually say (“Stop drinking soda.” “Eat more leafy greens.” “Make sure you’re exercising 3 times a week.” etc.) then you aren’t going to be making the gains you want. Same with massage. If your Massage Therapist tells you to drink more water, or stretch certain muscles, or something like that, then listen to them! If they want to see you once a week until you’ve made some headway in your back pain, do it! When you work with a Licensed Massage Therapist (which if you see us at Under Pressure Therapeutics, you do) you are working with someone who has the knowledge, skill set, and experience to help you with your pain. Not only are we trained to know how to help the muscles, we actually feel what’s going on in your muscle systems. We can tell if you are wearing your right shoulder high and what muscles are tight and possibly causing that. We analyze your posture. 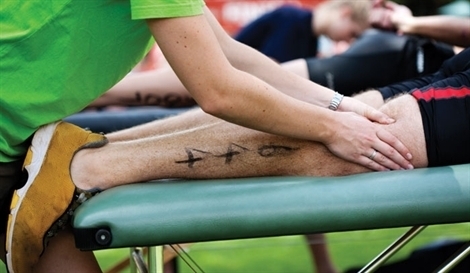 If your Massage Therapist tells you to stretch a certain muscle, do it! It will help. Sure, massage and exercise are different, but both play a huge role in your overall health and wellness. Both can help with limited range of motion and postural deviations, and both require commitment to see results. Previous Previous post: Young Living with R.C.